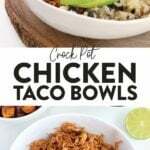 Make these clean eating Crockpot Chicken Taco Bowls to serve a crowd, or whip them up at the beginning of the week as meal prep for the days to come! This recipe is full of flavor as well as gluten and preservative free. Enjoy! All my meal prep people, where you at?! 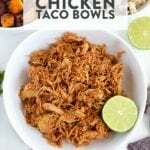 You’re going to love love love these Crockpot chicken taco bowls. They’re flavor-packed, nutrient dense and easy peasy lemon squeezy to whip up a batch for the week or your upcoming dinner party. Place your chicken breasts and minced garlic in a large slow cooker and set to high. Cook for 3.5 to 4 hours, or until the chicken is no longer pink inside. After the chicken is cooked, remove it from your crockpot and use two forks to shred it. Then place the shredded chicken back in the crockpot (keep the liquid that is in there). Then, season with chili powder, cumin, garlic powder, paprika, onion powder, salt, and pepper before finally adding tomato paste and water and place on top of chicken and mixing it all together. Now let’s talk taco seasoning for a sec. Making a double or triple batch of our DIY taco seasoning is a great way to have the perfect taco spice combo on hand any time you want to make this recipe or fajitas or nachos or really anything you want to add a Mexican twist to. If you are feeling lazy or don’t have all the taco spices for the chicken, feel free to use an all-natural taco spice pack that has as many real ingredients as possible. How gorgeous are these purple sweet potatoes? Thank you Whole Foods! The second I saw them, I knew I had to stock up on them. Why? For the photo….duh! Davida and I always laugh because we do some strange stuff….” for the photo”. If you run a food (or any) kind of blog, I think you can relate. What’s great about these flavor roasted sweet potatoes, is that this recipe would actually work for the vegans and vegetarians out there. These guys as your main. I’d stock up on the toppings to make sure you get enough protein in there, though! Roasted sweet potatoes….I made them twice last week. So in addition to your shredded chicken and sweet potatoes, we also put together a limey black beans + brown rice side for this recipe. It’s sort of a sister recipe to our Copy Cat Chipotle Cilantro Brown Rice. In case you are wondering, we used short-grain brown rice. It’s my jam…and has a WAY better texture than long grain (IMO). The next time you are at the grocery store, pick some up and try it! I promise you’ll never go back to long grain. You can also top it greek yogurt/sour cream, guacamole, salsa, etc! Get creative! Place 6 large chicken breasts and 2 tablespoons of minced garlic in a large slow cooker and set to high. Cook for 3.5 to 4 hours, or until the chicken is no longer pink inside. Remove chicken breasts from slow cooker and use two forks to shred it. 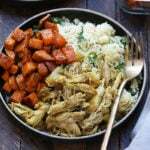 Place shredded chicken back in the slow cooker (leave the liquid that is in there). Then, season with chili powder, cumin, garlic powder, paprika, onion powder, salt, and pepper. Mix together tomato paste and water and place on top of chicken. Mix. First, preheat oven to 400ºF. Then, dice sweet potatoes into bite-sized pieces. Line a baking sheet with aluminum foil and pour on about 2-3 tablespoons of EVOO. Place sweet potato pieces on baking sheet. Then, season, and toss with your hands. Roast at 400ºF for 25-30 minutes or until desired texture. 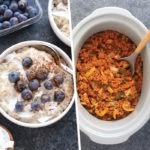 Place 2 cups of brown rice and 4 cups of water in a medium-size pot. Bring to a boil, then lower heat to low and cover. Let simmer until all of the water has absorbed. Once the rice has cooked, add in black beans, lime juice, and sea salt. Feel free to omit the chicken spices and use an all-natural taco spice pack!